The second-largest private collection of Dead Sea Scroll fragments, an early copy of the Psalms and interactive exhibits are among the features of the 430,000-square-foot Museum of the Bible that opened its doors to the public in Washington, D.C. on November 17, 2017. 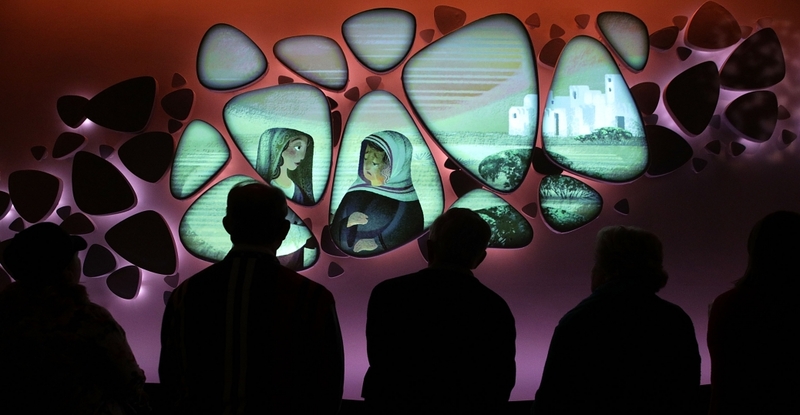 The museum’s eight floors delve into the impact and history of the Bible through paintings, videos and artifacts. Visitors are greeted by two 40-foot-tall replicas of the “Gutenberg Gates,” each weighing over 12 tons and bearing the words of Genesis. The privately-funded Museum of the Bible spent over 500 million dollars turning a former refrigeration warehouse into an airy museum that explores the influence, stories and origins of the Bible, with such features as a New Testament-era village and a rooftop “biblical” garden that houses many plants discussed in the Bible. The museum’s founder and chairman, Steve Green, has one of the world’s largest private collection of rare biblical antiquities (around 40,000), and many of those pieces are shown in the Museum of the Bible. But controversy over stolen antiquities and forgery has clouded the opening of this immersive museum. In July 2017, it was discovered that thousands of Green’s artifacts were smuggled out of Iraq in 2010 and 2011. Green, who is also the president of the arts-and-crafts retail chain Hobby Lobby, was slapped with a $3 million fine and had to turn over 3,500 cuneiform tablets and clay seals. While the museum did not use all the pieces Green offered to them, many do sit within the exhibitions. And the controversy doesn’t stop there.According to Kipp Davis, a biblical scholar at Trinity Western University in Langley, Canada, six of the museum’s 13 Dead Sea Scroll fragments are likely forgeries. While Green claims to have brought in experts to validate the authenticity of many of the ancient texts—including the scrolls—scholars such as Joel Baden, a Hebrew Bible scholar at Yale Divinity School, and Candida Moss, a professor of Theology who specializes in the New Testament at the University of Birmingham, say these experts are inexperienced, and not able to verify validity. The goal of the museum is to encourage people to read the Bible, and not to take sides on “divisive” topics. Part of this complex history? Slavery. Alongside proslavery text taken from the Bible itself are depictions of Jefferson Davis and the Confederate flag. The museum presents this text without taking sides. They also do not take sides on sexuality, contraception, gender identity or any other divisive issue of the day.Hobby Lobby, which Green’s father founded in the early 1970s, is no stranger to the limelight. In 2014 the Supreme Court heard Burwell v. Hobby Lobby Stores, Inc., where the evangelical business challenged the Affordable Care Act’s mandate that employers provide access to contraception to their employees. Green himself also provided a Bible curriculum to schools. What will the impact of this new museum be? Only time will tell. In the meantime, take a look at some of the highlights of the vast collection.